Tom Joscelyn informs us that the new Egyptian president, Mohamed Morsi, told a fired-up crowd in Tahir Square that he will work to free Sheikh Omar Abdel Rahman, aka the “Blind Sheikh.” Rahman is currently serving a life sentence in a U.S. prison for his role in the 1993 World Trade Center bombing and a follow-on plot against New York City landmarks. In addition, Morsi is a 9/11 “truther.” But he’s a moderate truther. His most recent position is that he isn’t sure whether al Qaeda was responsible for the 9/11 attacks. 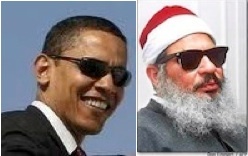 The Obama administration reportedly is relieved that Morsi won the run-off election, and believes he can become an ally of the U.S. Obama thus proves that the Sheikh isn’t the only blind actor in this farce.